Googling with the phrases "online screen recorder", there will be many results alleged the full support of free recording streaming videos, capturing gameplay videos, creating software presentations, etc. Given that searching a good free screen recorder on the web sounds a bit like a needle-in-a-haystack problem, the post will introduce top 3 online screen recorder free for you to capture screen video without costing a dime. 1. 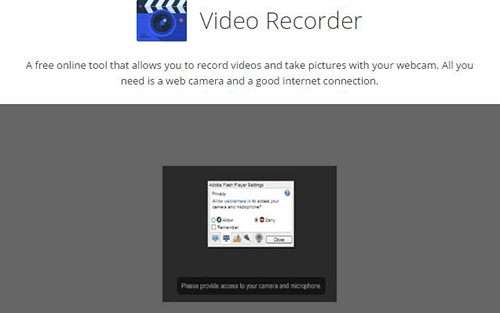 Record screencasts, online videos, audio, webcam with no download. 2. Take screenshots when capturing video from computer screen. 3. Convert the recordings into popular formats. 4. Output high-quality screen video and record desktop screen fast. 2. Record screen online freely and upload to YouTube seamlessly. 3. 100% safe. Free of malware, adware, ransomware, spyware. 4. No registration or subscription is preferred. Fear of adware or video length during screen record? Try MacX Screen Recorder - Record any screen activities happening on computer without network and convert the recordings to MP4, MOV, AVI, WMV, etc so that you can upload them to YouTube, Vimeo, Facebook and watch them on iPhone iPad Android on the go. 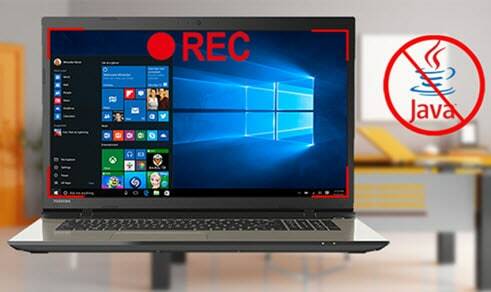 Here we focus on the best free web-based free screen recorders in 2019 with the abovementioned requirements taken into consideration. Since some online screen recorder outputs pixilated and terrible recordings, some don't record sound, some got retired due to antiquated Java RE like Screenr, while others consume a lot of CPU resources during screen recording, thus slowing down the process. So we do a reshuffle and list 2019 top 3 free online video recorder tools as below, with testing results for you to choose the most suitable one. 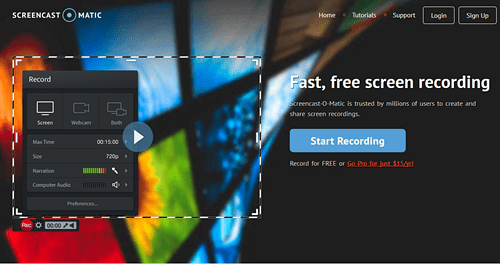 Screencast-O-Matic is absolutely one of the most preferred online desktop recorder tool for many gamers, businessmen, educators, and users to capture live videos online from YouTube, etc with narration. The process is pretty easy and fast. You just visit the site and instantly capture your computer screen by pressing the Start Recording button. No need to download any third-party software. Besides, you can save your recordings in MP4, AVI and FLV format with the online screen recorder and then import them for playing on your mobile devices anywhere. 2. Support both webcam and screen recording. 3. Share the recorded videos on YouTube, Facebook, Vimeo, etc. 4. Allow you to touch up, draw and zoom your recordings. 1. The free online screen recorder has a 15 minute record limit. 2. Create large output files, generally 1 minute seems to be about 15MB. 3. Inability to record audio during screen recording. It asks you to upgraded to pro version. 4. Bundle Plugin that is prone to lead to data leaks after downloading the launcher. 5. Rely on Wi-Fi or internet to get the screen recording work. 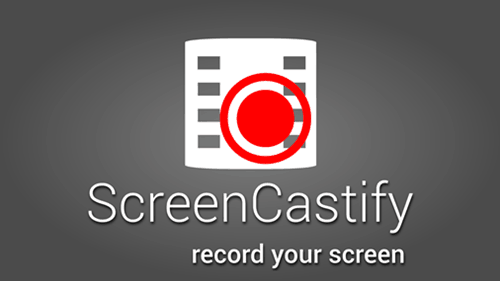 Screencastify is circumscribed to some extent, because this tool is an add-on especially designed for Chrome users. But with a little bit trial, you will be amazed at the online screen recorder. It is able to easily and fast record desktop screen online with audio inside a tab or from the webcam, without the aid of Java, Flash or other plugins. Thanks to the seamless integration with Google's Chrome, Drive and YouTube, the video tutorials, presentations, gameplays or anything else happening on the computer will be recorded in MP4 in one click away and then uploaded to Google Drive to save storage space, after installing the browser extension. 2. Share and easy to share to YouTube. 3. Upload to Google Drive for easy storage. 4. Flexible to configure the setting. 1. Only work with Chrome browser and devices. 2. Limit recording time within 10 minutes per video. 3. Capture maximally 50 videos from computer screen per month. A totally free online tool for you to create video recordings of your screen as long as you have a computer, a browser and a stable internet connection with no need to download any third-party software. You can record videos of any length with no time limit and flexibly tweak the video/audio settings, choose the quality, go to mirror mode or record full screen video, etc at your disposal. Recordings will be saved on your computer or in Google Drive or Dropbox for space saving. 1. Recording videos of unlimited length. 1. No video convert option. 2. Unable to upload recording to YouTube. 1. No special requirements for OS. 2. NO need to download third-party software and save disc space. 1. Network connection is must-have for screen recording and uploading. 2. The majority sets restrictions on the length of videos to be recorded. 3. Output options are limited to a few formats. 4. Some online screen recorders are short of features like video editing. 5. Some involves in adware or even spyware. 1. No video length limitation. 2. Feature more output formats and various edit functions, like trim, crop, merge, subtitle, etc. 3. Some professional software even offer many profiles for devices. 4. Screen recorder software even works without network connection. 1. Need good compatibility with latest OS. 2. Software installation is needed before screen recording. To sum up, if you mind the disc space and need an instant screencast, online screen recorder is definitely worthy of your try. While if the virus or adware is much more a bother and you need more output options for further use, downloading the screen recorder on your Mac or PC can be a good choice. MacX Video Converter Pro is a well-developed video converter featuring professional yet free screen recorder for Mac available to capture videos online from YouTube, Vimeo, Dailymotion, etc, record desktop screen (incl. gameplay, create video tutorials, software presentations, and more) in a click away and convert the recordings into MP4, MOV, AVI, MKV, MTS, WMV, and virtual any video formats at fast speed. Its 420+ preset profiles let you directly transfer the recordings to iPhone Xs, iPad Pro, Samsung Galaxy S9, YouTube, Facebook, Vimeo, etc so that you can play them or upload them without any format or file length issue. You can record screen on Mac by following the tutorial.